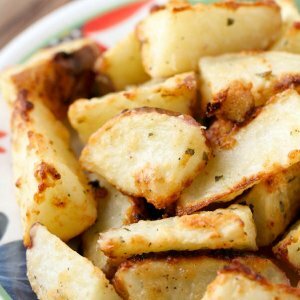 Simple and Delicious Baked Parmesan Potatoes recipe - the PERFECT side dish! Cubed potatoes seasoned with olive oil, parmesan cheese, ranch dry mix, garlic pepper, and salt. Dice and cube your potatoes. Place in a ziploc bag with oil and shake around. Add ranch and parmesan and shake around until well coated. Add foil to a baking sheet and add cooking spray. Spread potatoes on the foil and sprinkle with salt and garlic pepper.